Peppers make the garden brighter. The glistening greens of the leaves and the rainbow of colors of the ripening peppers - red, yellow, orange, green, brown or purple are so striking, you'll probably want to plant peppers in a spot where they can easily be seen and appreciated. The attractive plants make everything around them look better, healthier, and tastier. 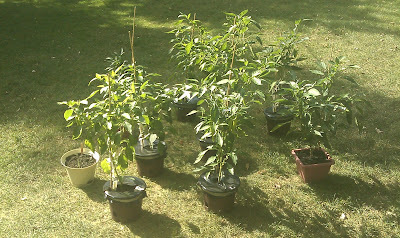 Plant peppers in full sun and in an area protected from the wind. Provide a well draining rich soil, keeping an even moisture level. Peppers need 5 or more hours of direct sunlight (8 hours may be the best). The more the light they can get, the better they will grow. Pepper plants are self pollinating and do not need insect pollinators to help them set fruit. Pepper and tomato seeds can be started indoors in individual pots or in peat pellets as early as mid-March to April. You can also purchase already started plants in May. Cucumber and zucchini should be planted directly into the container as they are more difficult to transplant. These seeds can be sown early to mid-May. For a fall crop, plant cucumber and squash seeds in early July. This produces a September harvest when the earlier plantings are beginning to decline. The potted plants can be moved into the garage during frosty fall nights extending the harvest into November. Peppers are heavy feeders, but they are also picky eaters. They like small amounts of food all season long. Too much nitrogen will produce lots of foliage but not much in the way of fruits. Before planting, add some organic fertilizer - dehydrated chicken manure, or any other type of animal manure. Alternatively, you can also work 2-4 pounds of a balanced fertilizer, such as 10-10-10, into each 100 square feet of soil. The numbers 10-10-10 refer to the percentages, by weight, of nitrogen (N), phosphorus (P) and potassium (K). For an extra boost at planting time, put a handful of compost or a teaspoon of 5-10-10, mixed with some soil, into the bottom of the hole and then cover the fertilizer with one to two inches of soil. This protects your plants from getting burned if the roots come into contact with the fertilizer. Peppers and eggplant are good container gardening choices because of their relatively compact size and growth habit. To start, buy some plants at your local garden store or start seeds indoors under lights. The biggest advantage to container growing is that you can grow them just about anywhere in the yard providing they get at least 8 hours of sunlight. They can be easily moved as needed to get more sunlight.The disadvantage to container growing is that you have to watch the watering more closely as they are above ground and dry out quickly. You will need containers to which you can add soil to a depth of at least 12 inches (8 inches is the minimum). The soil line should be about an inch below the rim of the pot. The container has to hold about 5 gallons of potting mix per plant and that it has drainage holes. A standard type plastic pot, the same height as diameter is recommended. It is essential to have drainage holes in the bottom or root rotting will occur. Place a round fiberglass screen of the same shape and size as the pot in the bottom to prevent soil from washing out of the holes. Half whiskey barrels, black plastic pots and bushel baskets can also be used. Some gardeners like to have casters underneath their container pots to make moving them easier, especially if they have to move potted plants around during the day to follow the sun. Use potting soil rather than garden soil if planting peppers in containers. Do not use regular garden soil. Regular garden soil can compact, become drenched with water and harm the roots. Potting soil is lighter and will stay aerated which will give the roots room to grow well. Because these plants are being grown in containers, you can mix the soil to the exact requirements, giving you better production. A good mix consists of one part each of potting soil, vermiculite (or perlite), sphagnum peat moss and compost. Add a slow release fertilizer at planting. 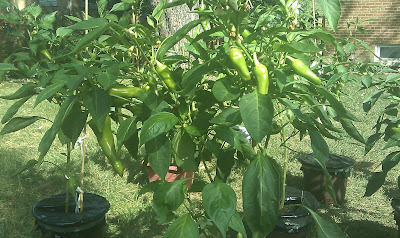 You should water your pepper plant in a container at least once a day when the temperature is above 65 F and twice a day when the temperatures rise above 80 F.
You will need to provide weekly applications of a liquid fertilizer. Fish emulsion, or a solution of one teaspoon of 5-10-10 to a gallon of water are good options. Alternatively, container peppers can be fertilized with a slow-release fertilizer once a month. - Once a week, spray their leaves with sea weed extract diluted in water (6 drops in a spray bottle that holds 1 cup of water). After the spray, pour the rest of the seaweed-water in the dirt around the pepper plants. - Every 3 weeks, sprinkle a balanced organic fertilizer (10-10-10) in the dirt around the plants and work it in to the soil. Don’t go crazy with fertilizer. If you notice that lots of the flowers are falling off (more than just 1 or 2 per plant) you might be over fertilizing. Cut back on the fertilizer and apply some epsom salts to help give your plants some magnesium. You can clip the whole pepper plants with remaining fruits attached before the first frost in the fall. Trim the leaves and hang he paltns in a cool place. Fruit will continue to ripen on the stem for a few weeks. Growing and enjoying healthy peppers. Jeff Bernhard, Executive Gardener YouTube channel.